There’s been a lot going on in my life lately – social obligations, family obligations, health issues, work stresses, and it’s getting tough to keep up with it all. There are many units of measurement for pressure. The one I (and many engineers) like is the Pascal, or some version of it (megapascal, gigapascal, etc). In ye olden days of science, the pressure at sea level was called one atmosphere (atm for short). Clearly this is an ill-defined unit, since first a person must know whether they are at sea level, and large variations in altitude may only change decimal amounts of the measured pressure in atms. Atmospheres: good in theory but not super practical. Most of us are familiar with the method of using mercury as a measurement tool. Typically used in thermometers, it can also be used in barometers. These are called Torricellian Barometers, after the inventor who made the first practical mercury barometer. Imagine there is a tray of mercury (yikes – don’t spill it!) and on the tray is an upside-down tube that has a very low internal air pressure (or is a vacuum). The air pressure pushing down on the mercury in the tray will push some mercury up the tube. Maybe it’s easier to imagine this in a more common situation – let’s say you have a keg of beer. (I’d take a keg of beer over a tray of mercury any day.) You pump up the keg to increase the pressure inside (you’re pushing more air into the already-full keg). As you pump the keg, beer will come out of the hose, because the internal pressure of the keg is getting higher. Cheers! 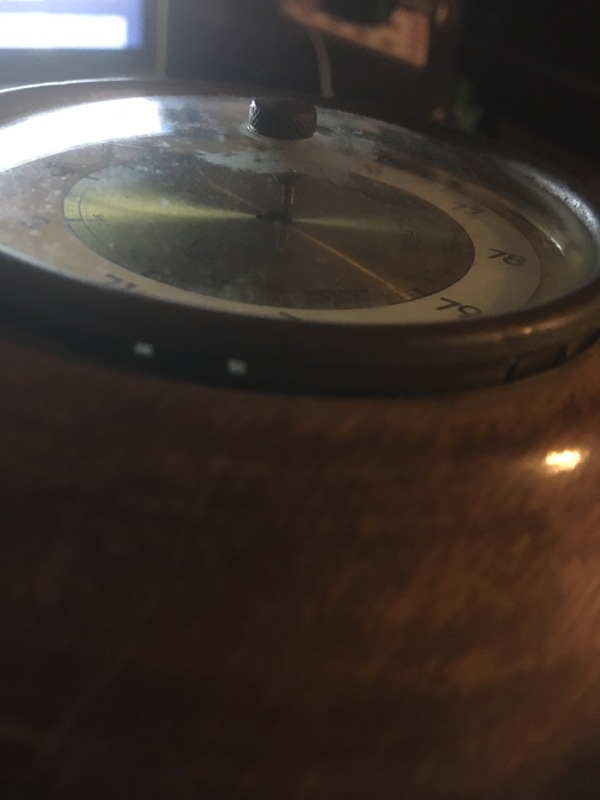 The barometer I cleaned up was an Aneroid Barometer. It operates on the same principals, but doesn’t use mercury. (I have a bad history with mercury, so this was definitely good.) A small thin container containing air is at the center. When the external air pressure is high, the container shrinks under the pressure, but only minutely. When the external pressure is low, the container expands minutely. The container lightly presses up against a lever – as the container expands the lever is pushed further, and as it contracts the lever pulls back. 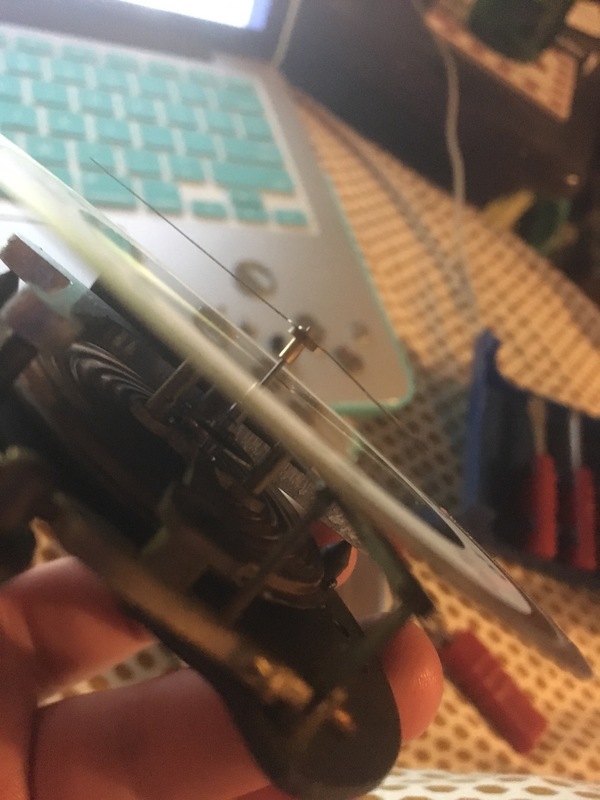 That lever (through a few other pieces, similar to clockwork) adjusts the needle on the barometer to indicate pressure. Cool! 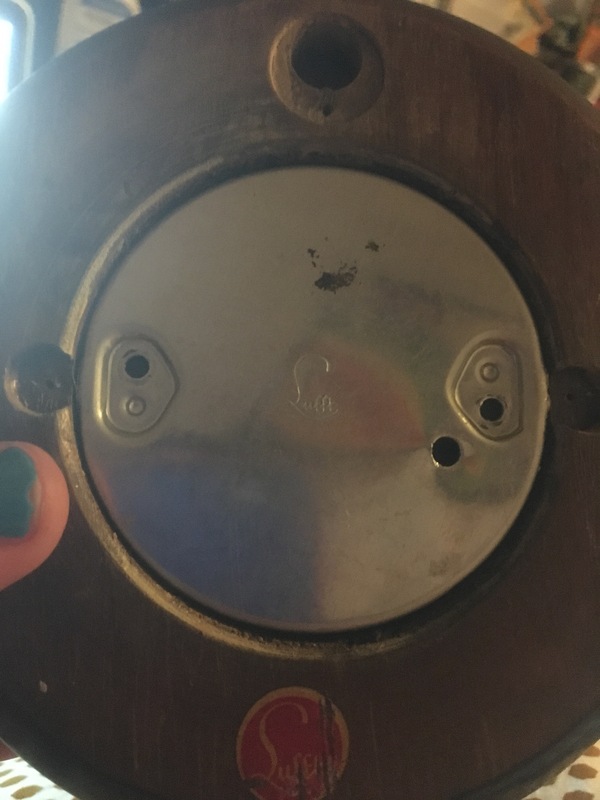 Below are two photos of the barometer, the first a weird sideways shot that I probably took by accident, and the second a shot of the back with the engraved (etched? stamped?) Lufft logo and the sticker of the Lufft logo. So I started with this Lufft aneroid barometer. Some googling led me to the Lufft homepage (they still make weather tools! That’s great). The Lufft website says that this style of logo was used between 1920 and 1954. Unfortunately I couldn’t find a more precise date of manufacture. The back of the wood frame has the number 825 pressed onto it, so presumably this was number 825 in the batch. Above, that flat cylinder by my finger is the container of air. It’s hard to see but there are some clockwork-type pieces that adjust the needle on the face of the barometer. Admittedly, the hardest part of cleaning this barometer was getting it open. The brass bezel was firmly secured along the sides as shown below. I used a standard pair of pliers to straighten the brass shown above curled around the edges of the face of the barometer. I tried to limit any scratching to the bezel itself. After getting that off I dug out my old friend Brasso (I didn’t mean to neglect you recently Brasso, I’m so sorry!) and it reliably stripped away the grossness coating both the brass bezel (that gold-ish colored ring holding down the glass), as well as the brass ring underneath it that was holding down the paper dial. This is where I apologize profusely for not taking a “before” picture because I would LOVE to show it side-by-side with the barometer now. I haven’t screwed it back into the wooden case yet, but the central part of it looks wonderful. So the outer units are cmHg, centimeters of mercury. 760 mmHg is equivalent to 1 atmosphere, and mmHg are units of pressure that are still fairly popular. I guess people use cmHg too… okay then. The inner circle of units are hectopascals (hPa) where 1 hPa = 100 Pa. Oh, science – why have one unit of measurement when you can have four? For those curious about the other words on the dial, they’re in German. Regen = Rain; Schön = Nice, Beautiful, Pleasant; Neigung Nach = Inclination To. (Thank you Google Translate!) Lower air pressures indicate a chance of rain while high air pressures usually correspond to pleasant weather. So I opened it up, I cleaned the brass parts with Brasso, I tested that all the moving parts moved in a way that seemed to make sense to me, and I steered clear of the container of air. I knew that if there was a problem with that, there wouldn’t be much I could do about it. So how does it work now? I downloaded an app to my phone to test it out! The app is called Barometer & Altimeter Pro in the App Store for those using iOS, and it’s free. Below are my preliminary data. I plan on taking more over the next few days (I’m hoping for rain) and for now I’ll just say that I’m cautiously optimistic that the barometer could be close to accurate. 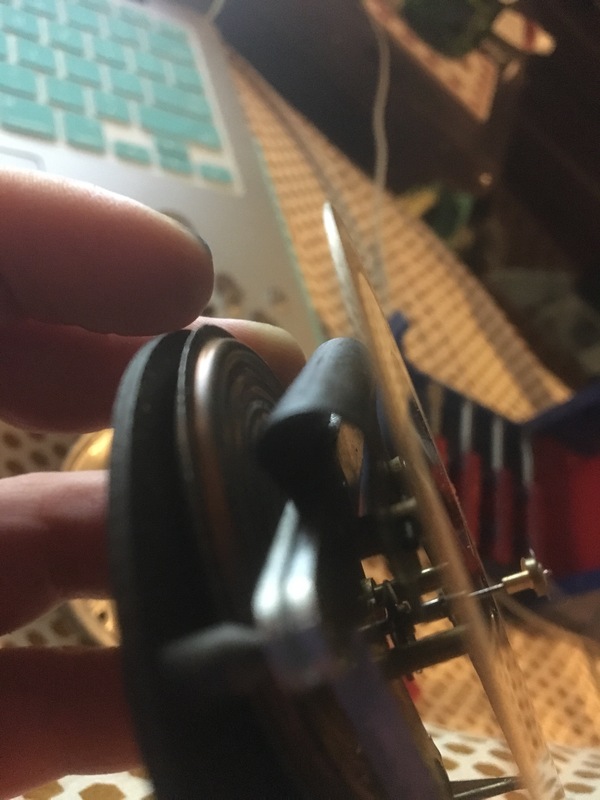 As a note, I was cleaning the barometer on 11/27/2017 at approximately 20:00:00. When I began cleaning the barometer it read 1005 hPa and the needle did not move. I had not yet downloaded the app to my phone, but I presume the air pressure was approximately the same as 36 minutes later, when it was 1013.86 hPa. Wondering about that brass knob and dial? Yeah, me too… until I started taking data. The brass hand isn’t connected to anything but the knob, and the knob is on the outside of the glass face, so it is excellent as a tool to mark what the pressure is currently. Come back and check the pressure a few hours later and the brass hand will show the previously measure air pressure, while the black hand will have moved to reflect the new pressure. Voilá! The aneroid barometer.